UBC biomedical engineering physics student Sampath Satti holds a commercial masimo pulseoximeter sensor and custom reflectance pulseoximeter. Satti is part of a team who are developing a overdose detection device. According to the latest B.C Coroners Service data, at least 1,448 British Columbians died of illicit drug overdoses last year. That’s nearly 28 a week! In the first three months of this year, that number rose past 30 deaths a week, 91 per cent of them indoors and alone. In answer to the increasing state of this crisis, Gordon Casey having made a lucrative living in finance in the Caribbean for 15 years, saw an opportunity to put his money to work for good when he moved to Vancouver in 2016. With the aim of saving lives, he committed $50,000 to a startup addressing the opioid epidemic. 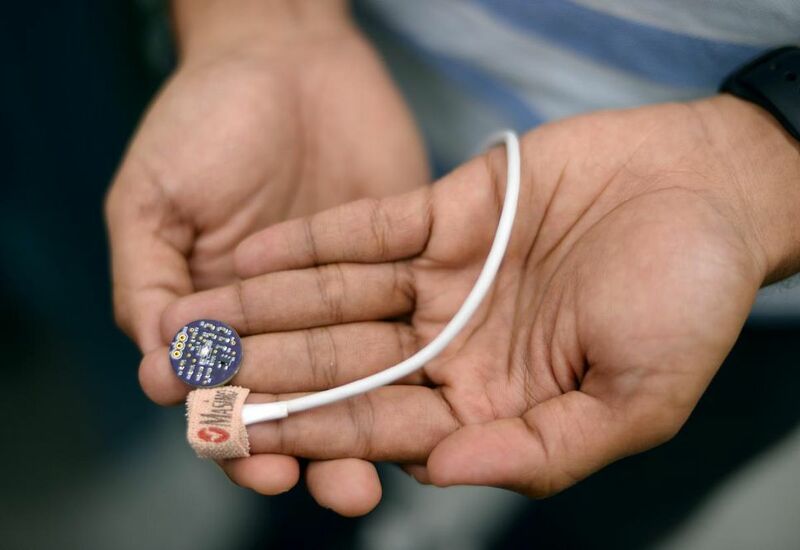 Seeing the need for a stigma-free buddy system for drug users, Casey and biomedical engineer Sampath Satti decided to use technology to invent one. “What if there was a local alert system that, when someone is using and an overdose episode occurs, we look at the physiological changes that happen in the human body and elicit a local response?” pondered Casey. The province, which experts said has become a world leader in the area, is looking at any number of technologies to help save lives from this overdose epidemic that has hit B.C. hard in recent years. For instance, the overdose-reversing drug naloxone has been made more available to the public, allowing pharmacies to carry the kits and creating online tutorials on how to use the antidote. While having a naloxone kit handy is helpful where aid available (there have been no deaths at supervised injection sites to date, for example), it isn’t much use when people use opioids alone, as overdoses can happen so quickly users can’t inject the antidote themselves in time. To address vulnerable lone users, Satti, a masters student at the University of B.C.’s biomedical engineering department, is developing a device that drug users can wear on their wrist or finger. The device is essentially a pulse monitor, but Satti and a team of engineers are developing software that can calculate users’ breathing rate based on very slight variations of their pulse. Since slowed breathing is one of the first symptoms of an overdose, the monitor could detect a problem. Naxalone can then be administered as once the device detects a suspected overdose, it would alert either health authorities or a network of volunteers to come to the person’s aid. Currently, Satti and his team have created a prototype of the wearable device and are at work to collect enough data to establish the exact relationship between heart rate and breathing. “We estimate that once this device actually gets built, this device will be cheaper than a Naloxone kit,” Satti said. It’s what he calls a “bare-bones project” as Satti and the handful of fellow engineers at UBC are not getting paid for their work. Consequently, they are making the technology open-source simply out of the desire to help, Satti said. Satti recently joined Casey’s company Brave in its small office in Vancouver’s Chinatown. Brave is a co-operative with 14 founding members and 50 pending members who are either users, or contributors — app developers, engineers, and community workers. Every member is a shareholder. The company is preparing for a four-week pilot project in July, in which 80 participants who frequently use drugs alone will test their prototype app, Be Safe. The app anonymously connects drug users with their peers who can monitor them via a phone call while they use. That peer would only get the drug users’ location if he or she does not respond on the phone, signalling a possible overdose. 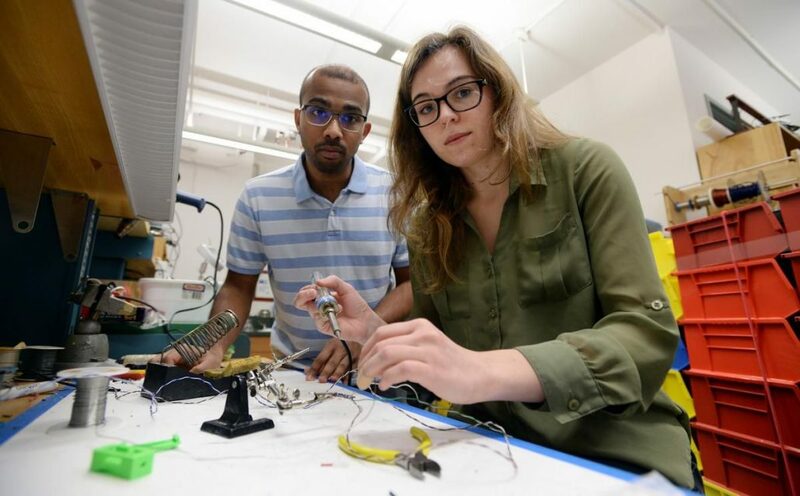 The pair hope to combine their two projects together to create a wearable device that detects overdoses and comes with a safety net of volunteers who can monitor and provide an antidote if people overdose. Read more about this helpful and essential innovation.